Hypoallergenic? Maybe. Friendly, mellow and affectionate? That's fur sure!!!! Although still relatively new to the U.S., Siberians have been popular in their native land and Europe for many years. This medium-to-large cat is best known for three things: its unusually thick, dense coat, its gentle and easygoing purrsonality, and the possibility that it may be a good choice for cat lovers who have allergies. One of the most unique attributes of the Siberian is what the CFA standard calls a “triple coat.” This essentially means that in addition to the guard hairs and awn hairs most cats possess, these cats also have a dense, downy undercoat that helps protect them from the worst of the Russian winter. The coat is heaviest near the chest and shoulders, with a full ruff under the chin. While this coat type needs more grooming than the easy-care Turkish Angora, Siberians are not the major challenge that some other longhair breeds represent. One or two thorough combings a week are all that you need to keep the coat in shape and reduce shedding. There is nothing extreme or angular about Siberians. Their head and body structure are characterized by soft, gentle curves, giving them a sweet expression, yet they project an impression of immense strength and substance. Bodies and legs are medium in length, as is the tail. They are heavy boned and very muscular. Slow to mature, these cats are not considered fully grown until 5 years old. What about the allergy issue? It has been scientifically proven that the concentration of Fel d-1 (a protein found in saliva and skin secretions) tends to be lower in Siberians than in the average mixed-breed cat. Since most people who have cat allergies react to Fel d-1, this means it is possible that they may NOT react to Siberians. While we have been able to help a number of allergic cat lovers become cat owners, we cannot guarantee anything in advance; we encourage you to contact us and arrange a visit so we can see how you are affected. The Siberian is as intelligent as the Turkish Angora — perhaps more so — but is nowhere near as “busy” or outgoing. 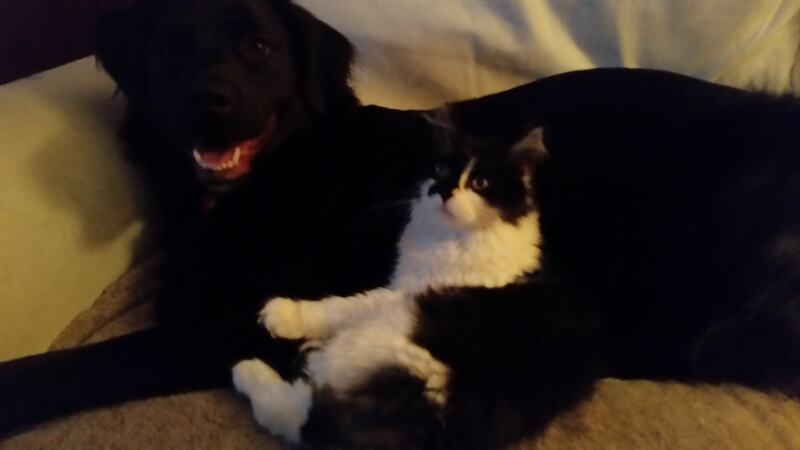 They are mellow, rather sedate cats, more likely to be found in your lap than chasing a toy around the living room. A Siberian will politely ask for your attention, but rarely demands it. When given your attention, they revel in it, purring loudly as you stroke their luxurious coats and snuggling next to you in bed. This doesn’t mean they aren’t playful, just that they don’t crave toys and make up private games with them, as some of the more active breeds do! champions, including several regional winners. Our focus is on traditional colors, but we work closely with Angara Cattery, where there is equal emphasis on traditional and colorpointed Siberians. So, while we do not ourselves breed the pointed Siberians, some of our cats carry the pointed gene. 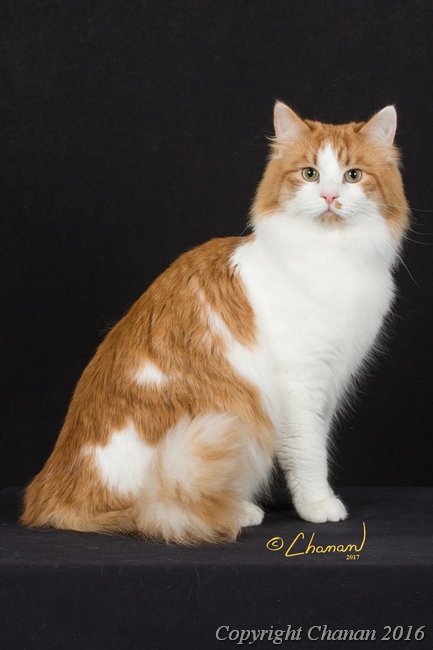 Most of our cats are brown tabby and white or red tabby and white, but our dream is to produce golden tabbies. 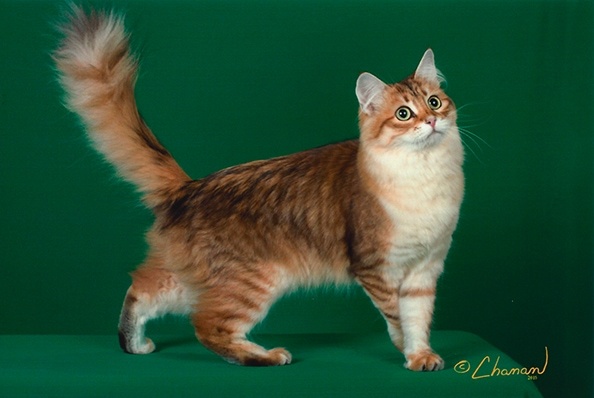 We have partnered with Angara to purchase a golden mackerel tabby female from Lumikissan one of the most prominent Siberian catteries in Europe and hope that she will be the foundation of a new generation of Folie a Deux and Angara cats.